The Richmond West County Detention Center is ending their contract with ICE. There are over 148 detainees currently there that need to be bonded out. The bonds average $5,000-$15,000. In addition, there are some local detainees that need to be returned to the Bay Area. Time is critical. The contract ends in 120 days and ICE has already started some transfers. We don’t just want the contract ended we want the detainees to be free on bond to pursue their cases with family support. So this gofundme has done so well. We have also have been doing bake sales the last two weekends and will one more weekend. The amount raised so far from the bake sales is over 7,000 so we have raised over 10k total. The detainees have all been moved and so far 19 people have been bonded out. 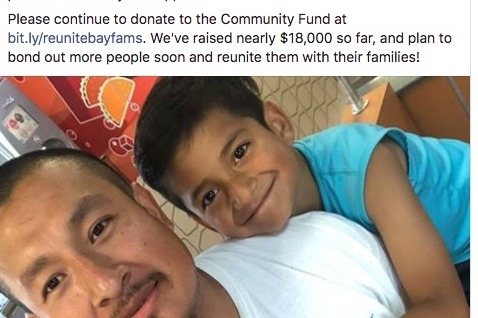 Freedom for Immigrants is still working with those moved and now not only has to pay the bonds but also travel expenses back to the bay area for folks. They need the money now more than ever. So if you haven't already please share the campaign with those who might support it. Sending our first check to Freedom for Immigrants today for $2492.46. We also are currently planning a Bake for Bonds Event to raise additonal funds. We really want to raise enough to get one family reunited. The current average is 10k so we have a long way to go but every donation matters! "We are thrilled to announce the first person bonded out with assistance from the West County Detention Facility Community Fund! After spending 10 months in ICE detention in West County Detention Facility, Jasiel, a 32-year-old father and resident of Marina, CA, was bonded out and reunited with his wife Almadelia, 9-year-old daughter, and 7-year-old son. Upon his return home, Almadelia shared the following message with supporters of the fund: "Thank you so much!! We are all together again and it wouldn't have been possible without your support." They reported they had raised 18k so far (and they haven't yet received our first donation). These donations matter. Please help us donate enough to reunite another family. We are only 201 dollars away from the $3,000 mark! Help us get over this mark today!